Let's Call this "Store It In A Comfortable, Humidity Controlled Space". Back in 1990, Muddy Wilbury (Tom Petty) sang those words about his Guitars, Basses, Amplifiers, and Drums; Accordions and Mandolins and Things That Sometimes Hum. While it makes for a really great song, it is an epically bad idea. Anything made of wood needs moisture to stay in good condition. Acoustic Tops will start to pull up, Frets on all instruments will start feeling sharp along the edge of the neck (something we call Fret Sprout). Humidity is your friend. Bob Taylor (from Taylor Guitars fame) suggests anywhere between 45-55% as being ideal for a guitar. If you can't quite manage that, he says 40-60% is acceptable. You can read more here. We have yet to find a whole house humidifier that will do the trick once the heat kicks on. If you have a room in your house dedicated to your gear, go grab a small humidifier and keep that room humidified. 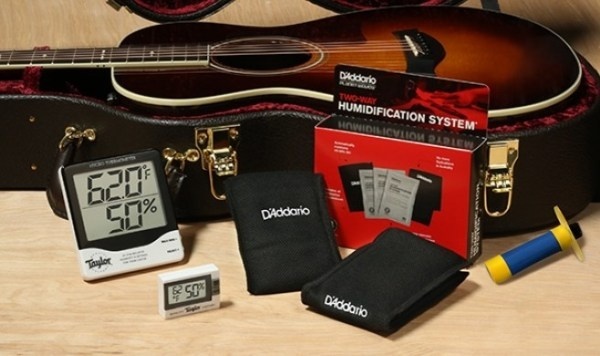 Better yet, if you keep your guitars in their cases, D'Addario (Planet Waves) makes a great little product to put in your case that keeps everything at a perfect humidity. We sell them here in the store. Call us or drop by and grab one. Gear is an expensive investment. Don't let a little thing like humidity ruin it for you.